Made with fresh fruit and Greek yogurt, Greek yogurt popsicles are not only delicious, they’re also good for you. They’re packed with nutrients so you can even have them for breakfast and start your day with a frozen treat. I’m more of a cereal and oatmeal kind of girl. Red is the one who’s obsessed with Greek yogurt. We buy them in bulk at Costco and she creates all these weird doubtful creative combinations that she swears are dubious, I mean, delicious. Those humongous tubs take up so much space in my our fridge though so one day that I was in a popsicle experimenting kind of mood (which was most days lol. 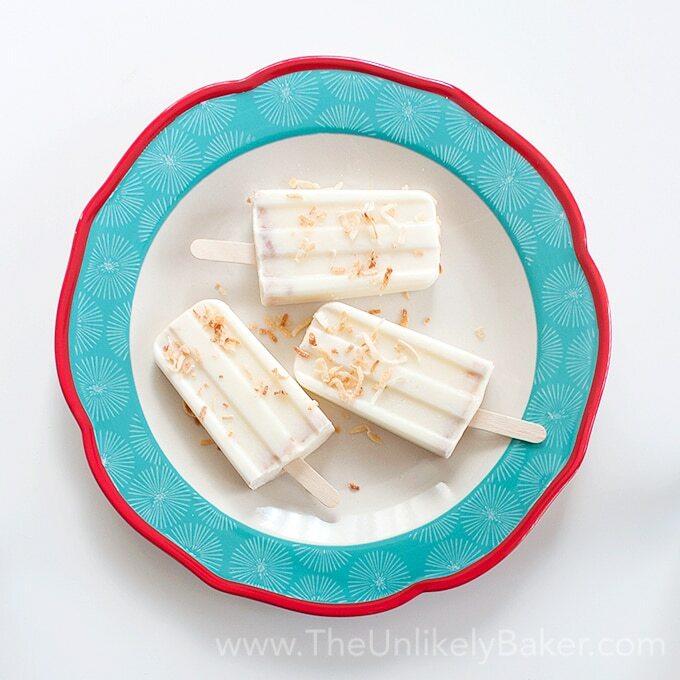 Have you checked out my coconut popsicles? ), I decided to take one of those giant tubs and use it in the name of science. And was I in for a surprise. They make for creamy, delicious pops. They’re not your usual sweet-on-sweet popsicles but tangy-on-sweet, which I like. And I see Red putting all kinds of fruit on her yogurt bowl so that’s what I did too. I loved Greek yogurt as a popsicle base so much I ended up using it to make 3 different popsicle flavours. Naturally, the first flavour combo I present to you is lemon (I’m not the Lemon Fan Club President for nothing). Lemon curd, to be precise. 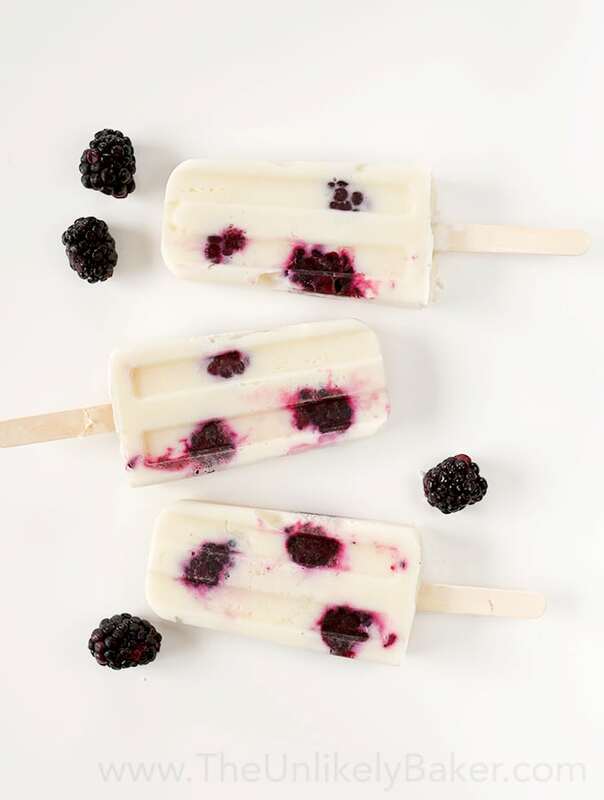 Then I put in fresh blackberries and you have a lemony pop with icy blackberry bites. Next are green kiwi popsicles. I promise I made them but I lost the pictures so (a very painful) lesson learned? When you think you’ve backed up your files, back them up again before you format your camera’s memory card (ironically I have several memory cards but I still can’t help wiping each one out after every use. Someone help me!). And yes, I had kiwi popsicles to make me feel better. Yummy ones. Moving on. The last flavour on here is roasted strawberries. Have you roasted strawberries before? Oh you should! Roasting brings out a fruit’s natural juices. Just divine. I blended them with the yogurt and out came those pink beauties you see on top. Roasting involves the oven though so if it’s too hot or too much of a bother, you can just use fresh strawberries too. Like no-churn ice cream, there is only a single basic recipe you need to remember when making Greek yogurt popsicles. Start with 2 cups of yogurt, add milk to thin it out a bit, your preferred sweetener to taste, then all your favorite things. So go and make your own favourite blend. Have fun! Greek yogurt popsicles are not only delicious, they’re also good for you. Have them for breakfast and start your day with a frozen treat. Put 2 cups yogurt and 1/2 cup lemon curd in a blender and blend until incorporated. Add milk, about a tablespoon at a time, until you get the consistency you want (not too thick, not too thin - must be creamy and smooth). Taste the mixture and add honey, to taste. Blend some more to incorporate. Divide and transfer evenly into your popsicle molds until they are 3/4 full. Drop 2-3 blackberries into each one. Freeze overnight or until frozen solid. Blend 2 cups yogurt and milk (add about a tablespoon at a time) until you get the consistency you want (not too thick, not too thin - must be creamy and smooth). Taste the mixture and add honey, to taste. Blend some more to incorporate. Put about a tablespoon of kiwi into each popsicle mold. Top with your yogurt mixture. Freeze overnight or until frozen solid. Put 2 cups yogurt and 1 cup roasted strawberries in a blender and blend until incorporated. Add milk, a tablespoon at a time, until you get the consistency you want (not too thick, not too thin - must be creamy and smooth). Taste the mixture and add honey, to taste. Blend some more to incorporate. Divide and transfer evenly into your popsicle molds. Freeze overnight or until frozen solid. Did you make Greek yogurt popsicles? Tell me about it in the comments section below. I’d love to hear all about it. What’s your favourite combo? These look delicious! I am definitely making these, already made up my mind! Thanks for sharing this popsicle recipe. This is next on my list. Your page is rapidly becoming my favorite source for new recipes. Thanks Dawn! You’re so very sweet 🙂 And no, we don’t need to pick just one, we can have all the pops we want! And seriously, that lemon curd version is my favourite 🙂 Have a wonderful week as well! Thanks Dunja! This is definitely a great twist to yogurt, if you’re getting a bit bored of the usual way of eating them 🙂 Would love to hear how your popsicle experiments go! 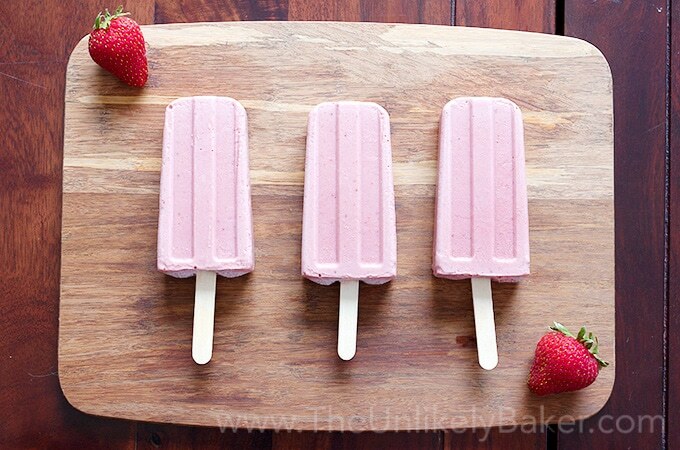 These greek yoghurt popsicles looks yummy! I need to make them myself, the photos look amazing. Hi Debonita! Thanks a lot. I’m excited for your popsicle adventures! Mmm! This looks yummy. My kids will love these!! I love that these are so easy! Yum!! So easy and so good 🙂 Thanks Clarissa! Hope you try them. 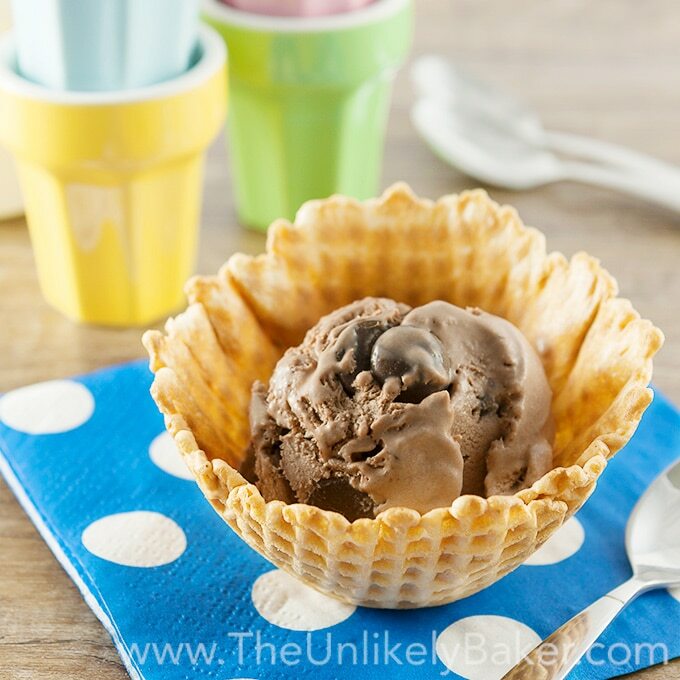 I love the idea of having a frozen treat for breakfast! These are beautiful!! I was going to ask where you got the popsicle molds but saw the link at the end. I definitely need to get that!!! Me. Too. 🙂 Popsicles for breakfast are totally okay because these are packed with healthy stuff! And I love my popsicle molds. Hope you enjoy making pops! They are so much fun! Thanks Rachel! I have to do this! Love this photos, and popsticles look so delicious! Do let me know how you like them! Thanks Borka! I see so much goodness in this popsicle. I need it! Yes! They are delicious AND good for you 🙂 Thanks Louisa! LOVE greek yogurt and these popsicles are perfect for summer. These all sound good but I particularly like the sound of the lemon curd with blackberry! Yes that’s my favourite of the three too 🙂 Hope you like it! Oh wow. These look so delicious! I will need tot ry. I’ve never made popsicles but I’ve got to change that. The kids love popsicles and I’d love that I could make them with flavors I know they’ll like. They would love your recipe and so would I.
Hi Terri! Thanks a lot. Hope you like them! I’m sure my kids would love these popsicles! It would be great for sunny days, they will surely love it. Hi Nicole! It would be a fun activity to do with the kids too 🙂 They can pick their favourite flavours. Awesome! Thanks for the pin. Happy Saturday! Wow, amazing idea, this looks so delicious! Yum yum yum!!! Thank you so much for sharing!!! I’d take the yum x3 🙂 Thanks Krista! And you are very welcome! Ice and summer always a great idea 🙂 Thanks Tiina! Hope you like these! Wow! These flavors are simply delightful. You can’t deny how lovely they are and perfect for the summer as well. What a great way to make use of fresh produce. Great recipe for making this. Thanks for the guide. My pleasure Lex. Give it a go sometime. Would love to hear about it. I LOVE greek yogurt and I eat some just about every day. The Lemon and Blackberry sound absolutely incredible!! Of the 3 that’s my favourite too. And you can replace blackberries with other berries if you like 🙂 Thanks Courtney! These look so good!! I love greek yogurt, I know my kids would love them as well. Thanks a lot Audrey! Just know these are more on the tart than the sweet side, in case your kids are expecting the usual sweet popsicle 🙂 But I do hope you guys like them! I love Greek yoghurt and the popsicles look delicious. I love that they are good for you as well! Me too! I won’t feel guilty eating a bunch because they are good for me, right? 🙂 Thanks Ana! 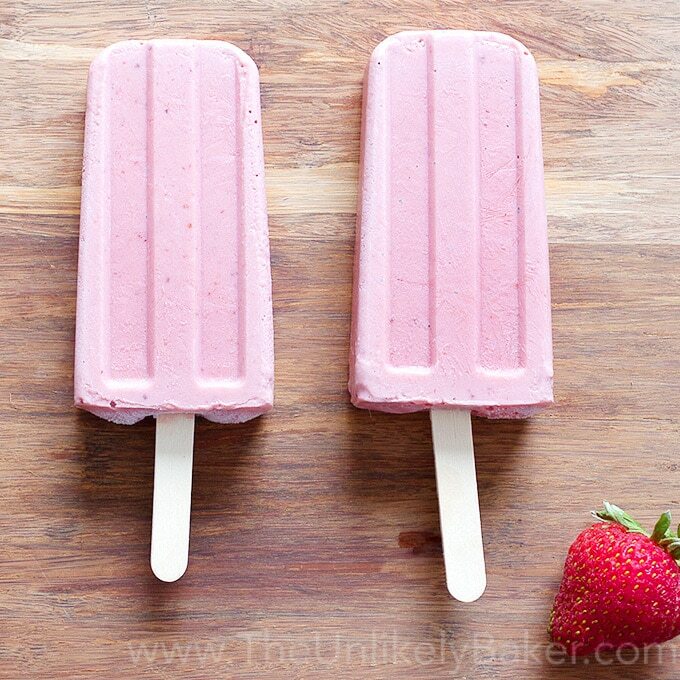 These look super delicious, I love the idea of greek yogurt pops. I will most certainly be making these before Summer ends. Sounds like a plan! Hope you like them. Thanks Maureen! These are some really fun flavor ideas. I’d love to try them all. Roasted strawberries do sound nice! This was the first time I roasted strawberries and they are such a revelation! And a great idea for berries that are on the brink of going bad. Thanks Liz! I love tart on sweet kind of pops too! Orange is my favorite but that strawberry is something I am looking forward too. Ooooh orange sounds amazing! Orange creamsicle, yes? Now I am craving that haha! Thanks Suchi! These look absolutely delicious, and the flavour options are too die for. Lemon curd and blackberry sounds yummy.